Andres, 25, had earned C’s and D’s in high school. He had struggled along through life and worked a few retail jobs before deciding in 2005 to enroll in the Academy for College Excellence (ACE). Then things changed, he says. Mostly it was his perspective on himself. “ACE basically gave me the confidence I needed,” he says. The Academy helped him understand his strengths – that he’s good with people and likes communication – as well as some areas in his life where he needs to grow, such as analysis and concluding things. He learned about other people’s learning styles as well. 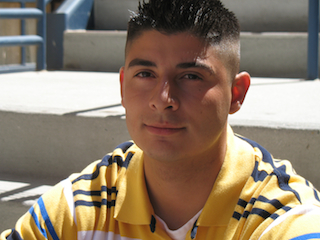 After the first semester in ACE, Andres began earning A's. He eventually joined the Cabrillo College Student Senate as a representative of students at the Watsonville campus. He now works as a recruitment intern for the Academy, helping students who are interested in enrolling in the program. At Cabrillo College he is working for his associate arts degree in communication and plans to transfer to San Diego in 2010 to study sociology. He then plans to pursue a master’s degree in psychology. “I want to be a therapist and help out young people,” Andres said. The program gave him the tools to expand his vision for himself, he said.